I met Sofia Navas at the Pole Dancing SM earlier this year, and Lisa Scharp is a new instructor at Vida Pole. 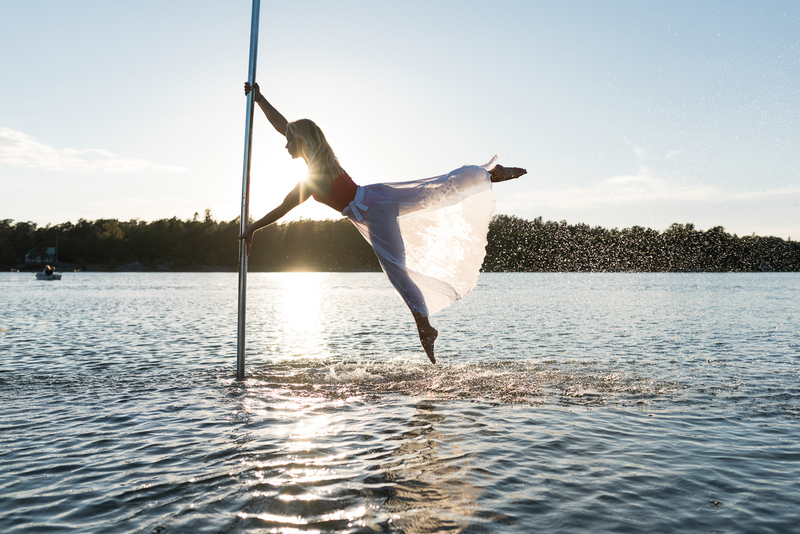 We teamed up for a pole dancing photoshoot in the archipelago. In Greek mythology Tethys is the mother of the Naiads and Oceanids, which are fresh water and ocean nymphs, in case you wonder how we came up with the blog post name. Our original idea was just to photograph somewhere along the coast, but Lisa told us they had a boat at their summer house which was located in the area, so our plan evolved. We ended up loading the pole into the motor boat and headed out to a spot that Lisa had scouted for us a few days prior. For this shoot I had brought my 35 mm lens with me, since I was not sure how much space there would be, and also I wanted to include the scenery around the pole. Turns out the little island we found was reasonably big, so I could have got away with using my standard 50 mm. En route to our photoshoot location. The boat loaded with pole dancing gear, as well as lots of water and food to last us the entire day, because once we got there we did not plan on leaving for quite some time. The pole is rigged, and Sofia Navas tries it out doing a Kiley Cupid. It is quite fascinating to see how the pole dancers climb a pole in order to get into their desired pose. Some of the intermediate positions looks quite good, here I snapped a shot of Sofia Navas as she was climbing into the intended pose. No Hands Jade by Sofia Navas. I cleaned some of the islands in the background, to create a cleaner photo here. Sofia cleaning the pole. I also brought a reflector along to help lift some of the shadows when the sun was out of the clouds. Here the sun had come out again, and I could get this shot of Sofia Navas against the clouds in the sky. My local food store had soap bubble bottles for sale, so a few days before I had randomly bought one, and brought it along for the shoot. Here Lisa is blowing soap bubbles while sitting on the pole. Lisa and Sofia. We just finished shooting on the island, time to move the pole! Lisa Scharp and Sofia Navas. The water was quite shallow a little bit north of our small island, so we put the pole on the boat, and moved it over there. Lisa Scharp doing a reverse grab spin over the water. Two girls, a pole and a bucket! Recipe for success! Sofia Navas is doing a variation of Cross Knee Release. A wet pole is a slippery pole. Sofia Navas whipping her hair. We experimented with different techniques to wet the hair. 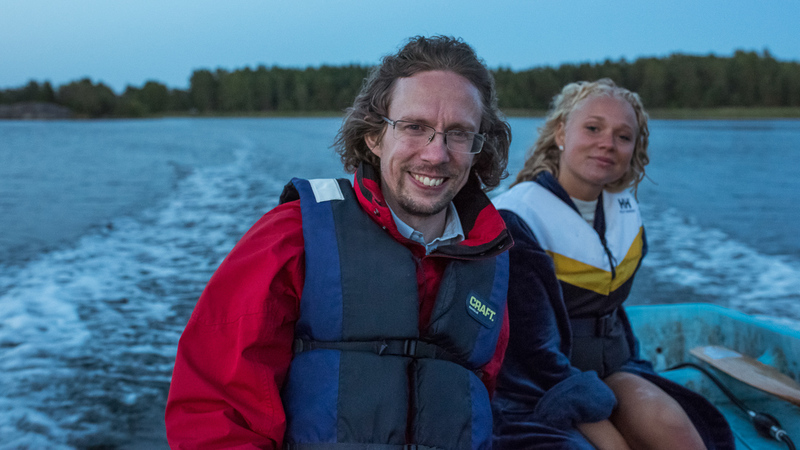 Johannes Hjorth and Lisa Scharp. The sun set, and we started dismantling the pole and packing everything up. A long journey back home in front of us, but happy with the results of today’s fun photoshoot. A big thank you to Sofia and Lisa, and also to Vida Pole for lending us their portable X-pole. 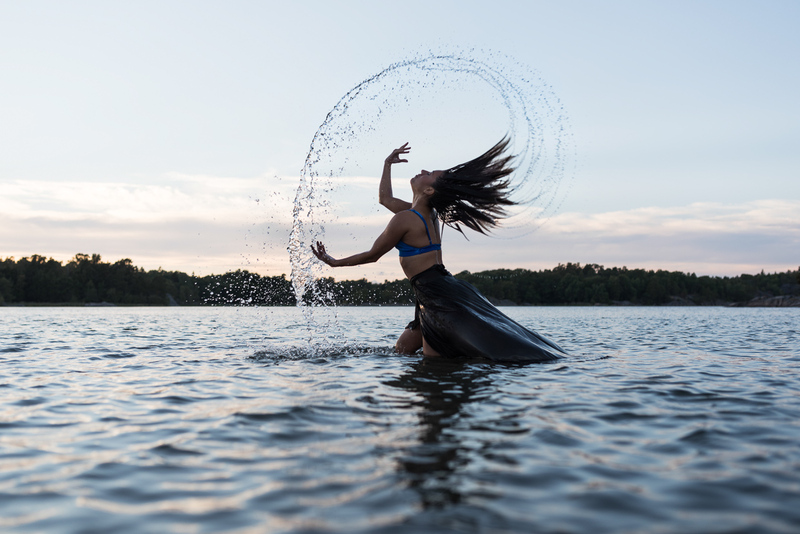 If you are interested in learning pole dancing, check out Vida Pole in Stockholm and Aerial Studio (discontinued, see FLOWKarlstad) in Karlstad. For more pole dancing photos, check the pole dancing tag on the blog.